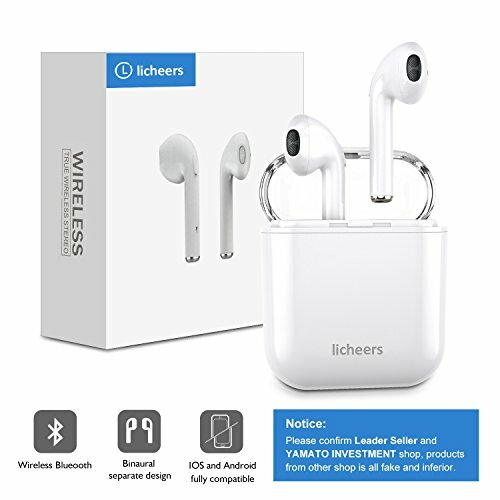 Bluetooth Headphones, LICHEERS Mini Wireless Sports Earphone/Stereo-Ear Sweatproof Earphones with Noise Cancelling and Charging Case Fit for Samsung Galaxy S8, S8 Plus iPhone X/8/7/6/6s plus by Licheers at B Bluetooth. MPN: LRZJ-001. Hurry! Limited time offer. Offer valid only while supplies last. 【STRONG CONNECTION 】Pairs and connects with smart phones and other Bluetooth enabled devices up to 100 ft. With built-in microphone, this headphone is great for hand-free communication. Eliminates stethoscope effect of all wired headphones and reduces noise. Please confirm to buy leader seller shop of brand licheers, Although the price is cheaper，but from other shop is fake and inferior. If you have any questions about this product by Licheers, contact us by completing and submitting the form below. If you are looking for a specif part number, please include it with your message.